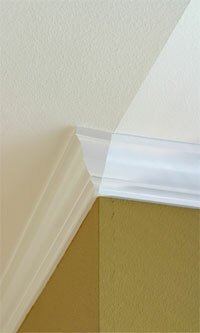 This home is a good example of how moulding can change the feeling of a brand new home. 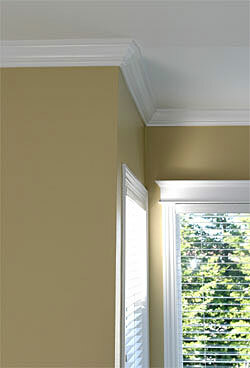 The Mark Benda signature - "chunky" size moulding - provides a crisp, bright accent of the lines of this spacious home. The architecture is enhanced with moulding following the roof lines and built up door and window frames, without compromising the clean, modern lines. 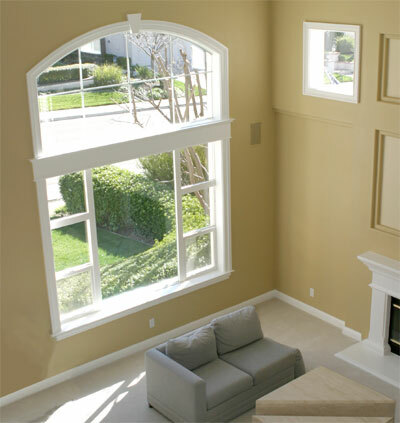 Notice the keystone over the flex arch window frame; Mark's technique is to combine several pieces of moulding to create a look. 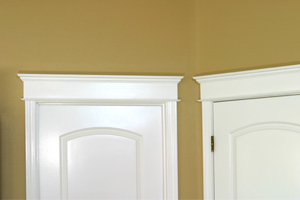 The top of the front door is another example of 3 or 4 kinds of trim combined for a built up moulding profile. 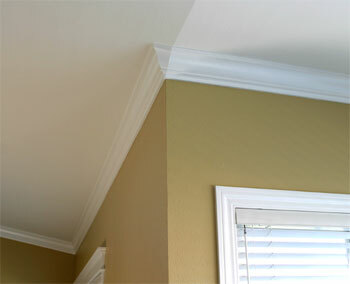 The beauty of moulding is that it works in a very traditional home, or with more modern furnishings. 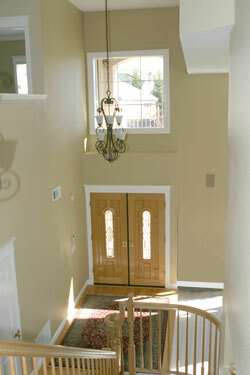 Woodwork adds a feeling of quality to a new home and increases its value and appearance permanently. 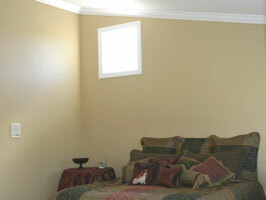 The beautiful mustard color is sunny and easy to live with and provides a good contrast to the moulding. 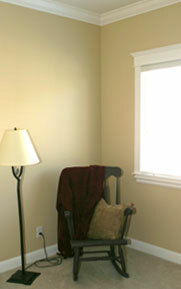 Mark has great rapport with his customers and treats their homes and families with utmost respect. 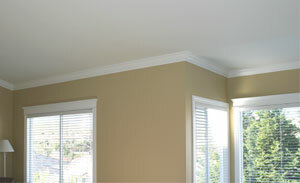 Moulding Masters does one job at a time so the crew is always meticulous and on time with their projects. 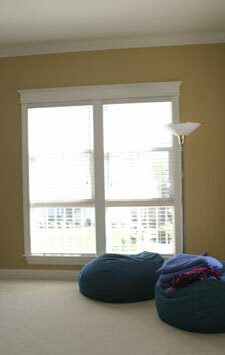 This room has a partially raked ceiling which you might think are an impossibility for crown moulding. Actually, this kind of challenge creates an opportunity for interesting detail! Every odd corner, change of angle or height actually contributes to the overall impression of the room and the area you were dreading turns out to be a delight! 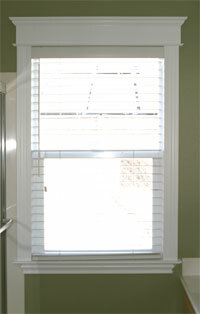 Accurate measurements are important to produce the beautiful results. Moulding Masters measure two and three times to make sure we are precise. 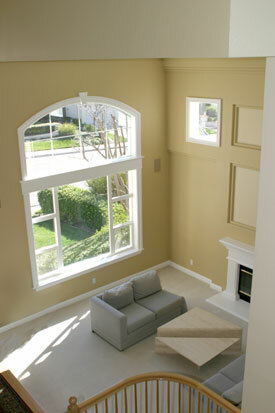 Here's another interesting ceiling angle emphasized by the placement of the window. 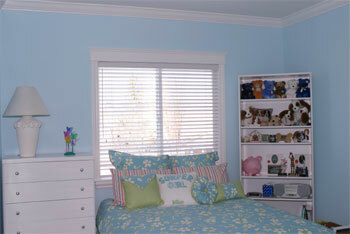 This room is painted an incredible shade of blue which really doesn't translate into web colors! 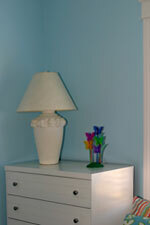 It's a bright shade of blue between robin's egg and turquoise and just sings! 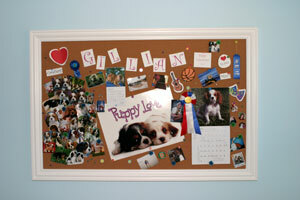 At left photos of King Charles Spaniels - the family dog is a King Charles Spaniel. 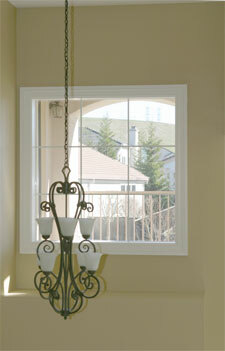 Upstairs rooms are in tones of golds, maizes, and a wonderful green that is soft apple green. 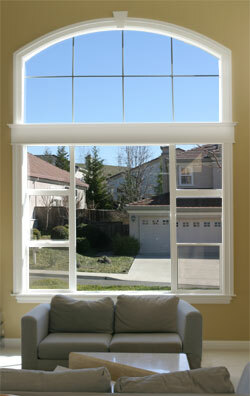 Back to Project Windows have built up frames throughout the house giving the house a comfortable, solid feeling.